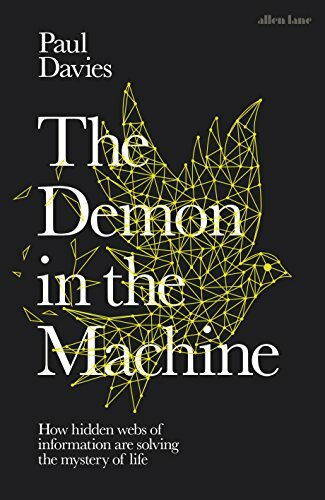 Recently, we quoted Paul Davies writing on the information content of life forms in New Scientist, in connection with his new book, The Demon in the Machine, to the effect that the really tough question is how life’s hardware can write its own software. If you look at the paper, notice Figure 1, where a colleague and I argue that the information flow is growing exponentially. If information is a conserved quantity, then the ability to increase the information flow leads to faster and faster complexity. This is a property of feedback-enabled or “bootstrap” systems, as illustrated by the Intel/Microsoft “bootstrap” of a computer program that starts from a ROM chip on the motherboard. Davies realizes that all these OOL projects (and he’s had a hand in several of them), focus on the hardware. But it is the software that is controlling the hardware, and it is the software that is growing in complexity. So if the software is managing the information flow and bootstrapping, then the focus needs to be on “laws of physics” that use feedback networks. There aren’t very many institutions that fund that sort of research because physics almost always defines itself as a commitment to reductionism, leaving “networks” to the biologists and biochemists. So Davies is wistfully imagining that the study of “networks” will eventually reveal a reductionist “law”, and somehow we’ll arrive back at physics again. This was certainly the hope of the Sante Fe Institute in its early days, though after 40 years it appears to have given up. Is it reasonable for Davies to hope for a “law” of information multiplication in physics? I think it is a reasonable hope provided that we redefine what he means. The work that George Montañez has done on irreducible complexity suggests that we have a method of measuring information and complexity of biology. If Montañez adds self-reference to his definition, we would be well on our way to defining the information content in a cell. Davies is suggesting that the way to pack more information into a smaller volume is effectively to make information hierarchical. It is as if we take a text, compress it with PKZIP, add some more zipped files, and then pack them all in a library file. When we need the information, we read the header in the library file, extract the file that we want, and then unzip it. This packing and zipping can be done again and again, putting libraries inside libraries inside libraries, as much as is needed, so that an incredible video game with great graphics displaying Terabytes of information can be shipped in a file of 1 Gbyte. But what Davies perhaps doesn’t recognize is that the header files, the directories must be “above” the information level of the files. Nothing in the zipped file tells you how to extract it. Yes, there are “self-extracting” files, but those are more properly “programs.” And I guarantee that if you made one on Windows 10, it won’t work on my Linux 18.04, because it relies on “knowing” the operating system that reads it. The Department of Defense has some 40-year old computers in a bunker whose only job is running old software, should there be a need to cross-calibrate output. Which is to say, to preserve the information in those old programs, they also need to preserve the old hardware. So if Davies believes that a hierarchy of information can pack more information in, and possibly explain the incredible information content of biology, then there must be something “outside” or “above” the biology that is responsible for the compression algorithm. That information cannot arise from inside the cell any more than a self-extracting program can exist without the operating system/hardware outside it. The only thing Davies hasn’t done is name this attribute. Should we suggest a name? How about … intelligent design? See also: Paul Davies: The really tough question is how life’s hardware can write its own software Davies, author of The Demon in the Machine:How Hidden Webs of Information Are Finally Solving the Mystery of Life thinks we overlook the difficulty and offers a solution: Nature got there first.